INTRINSICALLY SAFE TANK LEVEL ALARM alerts if liquid level is high or low with a loud beeping and flashing. Always on duty because battery power is uninterruptible. 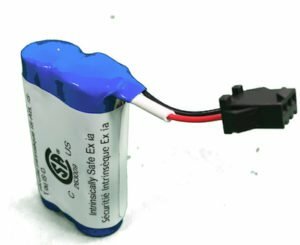 Replaceable Lithium battery included lasts for years. Rugged. Built for rough, wet and corrosive environments. Bright flashing LED visible in daylight. Hazloc Class 1, Div. 1. groups C and/or D. 60079-0 and 60079-11. Zone 0. EASY TO INSTALL. 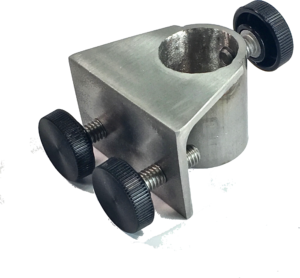 The liquid-tight 2″ NPT tank mount is adjustable by hand. Simply loosen the nut and slide the alarm to the depth you want. Other mounting hardware available if needed. Battery powered so it can be located anywhere, instantly. When there is a high or low level condition, the buzzer sounds and the beacon LED will flash. In the default mode, the user presses the button to silence the buzzer, and the LED continues to flash as a reminder. 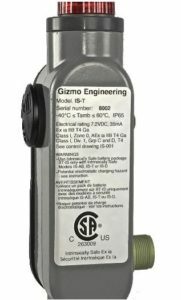 The 101 dB buzzer has a unique warbling sound cuts through factory noise so it will be heard. Battery Power is uninterruptible and allows installation anywhere. No outlets, electricians, or inspectors needed. The Lithium batteries included and have a shelf life of 20 years. A 2400mA-hr capacity combined with smart software allows these to sound for 25 days straight! In typical situations the batteries will last for many years. When the batteries do run low, a unique low-battery signal is given. (different from the level alarm signals) Batteries are user-replaceable in the hazardous location. Pipe and float switch are 316 stainless steel construction. There is even a SS float guard available to protect the float switch for applications where the alarm is being moved frequently. Grounding lug is included on stainless steel units. Optional Relay Output for connection to safe areas through an I.S. barrier. 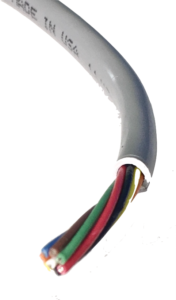 Choice of materials: stainless steel pipe and float switch or BUNA float switch, or polypropylene pipe and float switch is a more economical option. The wetted parts are available in 316 stainless steel except the retaining rings on the float switch which are 15-7SS. Click here for chemical resistance chart. The alternative construction is polypropylene which is suitable for temperatures up to 200 deg. F [93C] Click here for a chemical resistance chart. We stock other materials too like PTFE and Kynar. Please call us for more information on these. Here is a breakdown of a typical part number IS-T-SS-12. an open tank or truck opening with SS thumbscrews. For applications where the alarm is frequently removed from tanks or drums the guard prevents damage to the float. Secures to the pipe with set screws. A relay output for signals sent to an approved I.S. barrier. 80mA max. 10ft cable is standard. A 2″NPT stainless steel plug welded to the pipe. Depth is not adjustable. Extra cable length over the standard 10ft length. Heavy 0.032″ jacket for superior durability, eight stranded conductors x 24 gage.